REA Grimes are thrilled to present No. 30 Ardgillen Lawn to the market. This 4-bedroom family home is superbly located in a quiet cul de sac and comes with the benefit of a rear extension. The property is presented in excellent condition throughout and offers bright and spacious accommodation. Upstairs the accommodation is equally as spacious with three double bedrooms, one single bedroom and a newly refurbished family bathroom. Ardgillen Lawn is a highly sought after, mature residential enclave of family homes, within easy walking distance of a wide range of amenities. There are a host of educational & sporting facilities on your doorstep. Located to the rear of Balbriggan Golf Club, a rolling parkland 18 hole course set on c.170 acres, on the edge of town bordering the village of Balrothery. 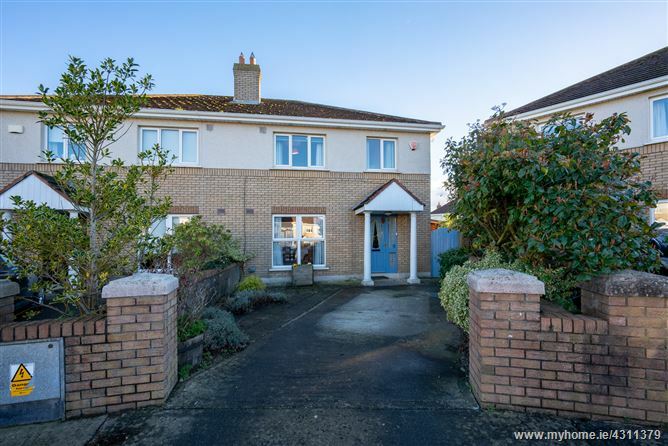 There are many amenities close at hand – shopping, schools, public transport (100 Bus Eireann & rail) restaurants, hotel, and an abundance of sport activities both in Balbriggan/Balrothery and nearby Skerries. 2.98m x 2.14m	Bright and spacious hallway with wood flooring. Alarm pad, dado rail & carpet on stairs. 6.29m x 5.95m	Tiled floor, shaker country kitchen, electric oven with four ring hob and extractor fan. Wooden worktop, French doors to rear garden, 2 Velux windows & spotlights. 2.99m x 5.75m Bright east facing room with laminate flooring, storage heating, en-suite, wc, whb window with west facing side garden.